At the heart of the large tract of land lying between the Breamish and Harthope Valleys, Threestoneburn Wood clings to the eastern flank of the majestic Hedgehope Hill. The area surrounding the wood is littered with crags crying out to be visited. It is a landscape of ancient habitations, where hillforts, burial sites, farmsteads, field systems and deserted medieval villages abound, where views stretch out into the far distance and the high Cheviot Hills cast shadows across deep valleys. From the beautiful Breamish Valley to the second highest summit in the Cheviot Hills, this walk takes you to some of the finest crags the area has to offer. You will encounter the past as you step out into the future. You will be inundated with outstanding views as you listen to the sound of the wind rushing by. It will pass before you have time to catch your breath. 1. The road into the Breamish Valley, perhaps better known as the Ingram Valley, lies off the A697 less than a mile to the north of the village of Powburn. A delightful 4 mile drive will bring you to Peggy Bell`s Bridge and, once across the river, there is ample roadside parking in the shadow of Ingram Glidders (GR NT996166). The bridge, believed by some to have been named after a young woman who drowned in the river on the 22nd November 1890, was built in 1910 and is an early example of a pre-cast concrete bridge. The word `glidders` means `scree slope` and each year, as part of the local show, the long established Ingram Fell Race climbs this 60 degree slope to the top of Brough Law, before making a rapid descent to the finishing line at Bulby`s Wood. Not for the faint hearted! Now it is time to follow the road as it climbs away from the River Breamish, squeezing between the flanks of Hartside Hill and Knock Hill. 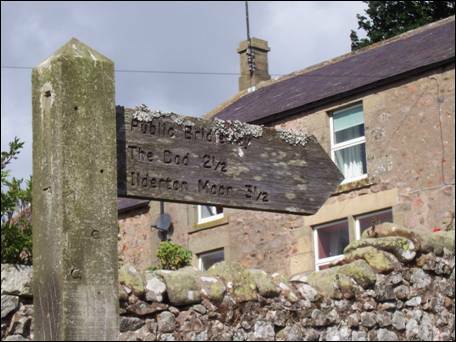 On reaching the buildings of Greensidehill, take the bridleway signposted `The Dod and Ilderton Moor` and continue in a north westerly direction, with the Willow Burn below you to your right. Across the burn, on the east side of Hunt Law, lie the remains of a medieval farmstead and an adjoining field system. At the point where the bridleway splits in two, marked by a directional fingerpost, take the left hand fork and then when you join the Linhope to Ilderton Moor bridleway (GR NT977173) turn right. The impressive Cunyan Crags rise away to your left lying along the eastern spur of Dunmoor Hill. 2. After just more the half a mile of walking along this green track the route bends away to the left, as it climbs, through bracken, towards the corner of the Threestoneburn Wood (GR NT984180). On reaching the stile on your right, climb over and, after crossing the post and wire fence, turn left and walk the very short distance to the top of the small mound. From here, looking eastwards, you will see a large circular stone sheep stell and this is your next target. Head straight ahead past the stell and through the four large stones beyond, joining a track which continues in the same direction. Ignore all other tracks as you proceed eastwards with a post and wire fence away to your left and more or less parallel with you. After approximately 400 metres you will notice that a fence from the north east joins the fence to your left. At the junction of the two fences (GR NT992181), climb over the parallel fence and a small grassy mound will make the `operation` potentially less `painful`. With the `new` fence now on your left, head in a northerly direction along a distinct green track. Keep with this track, which sometimes becomes a little boggy, as it continues to hug the fence line. Every now and then tantalizing views of the areas larger hills will appear to the north-west. 3. Presently, the distant farmstead of The Dod will come into view, lying to the east of a small belt of trees. Keep with the track, and following the occasional public footpath directional fingerpost, pass to the left of the cottage towards the step stile over the fence and into the trees (GR NT991198). Head straight through the trees and within 50 metres you will be back into daylight and once again crossing a step stile. Cut diagonally across the field, to your left, where yet another step stile will lead you onto a gravel track. Turn left. The views begin to open up as you head in the direction of Threestoneburn Wood. Pass through the ford of the Threestone Burn, or cut across the adjacent footbridge, and then pass through a five bar gate. The track continues towards the wood. Inside the wood lies the isolated Threestoneburn House, a building with a history dating back to the 18th century. It is a Grade II Listed Building. Nearby, lie the remains of a Bronze Age stone circle consisting of 16 stones of local pink granite. Only four of these stones are still standing, two of which still show evidence of the packing stones that were pushed in around their base to help keep them upright. You do not follow this track, instead turn immediately right (GR NT983202) to pick up the quad track which winds towards the top of Dod Hill. 4. Near the top of the hill, when the gradient begins to level out, leave the track and a short walk eastwards will bring you to the walker`s cairn just beyond the summit (GR NT987208) of this 353 metre high hill. The hill and the surrounding area is littered with the remains of former usage, including a medieval settlement, a Roman Period farmstead and a number of Bronze Age cairns. From the top of this historically fascinating hill there are fine views in all directions. Retrace your steps across the top of the hill and rejoin the track back down to the gate near to the Threestone Burn. Turn right and within 20 metres turn right again, this time along a green track heading in a generally north westerly direction. Eventually you will meet with a gravel track, coming away from the wood, which you will follow to the right for approximately 200 metres. Here (GR NT979211) you must turn left as the track begins to climb towards the 404 metre high Middleton Crags. When parallel with the crags, leave the track to spend a few minutes exploring the rocky promontory (GR NT976215). After taking in the view, go back to and continue with the track until it cuts through a series of 10 wooden shooting butts. Turn left behind these butts and stride out towards the obvious Langlee Crags, a short distance ahead. The crags cover a fairly wide area of ground so be sure to make your way north westerly to the most prominent of the crags (GR NT966221). Photo opportunities abound. To the north-west, downhill towards the Harthope Valley, is a prehistoric landscape containing three enclosures, an extensive field system, burial cairns and Bronze Age hut circles. The views towards the valley and westwards to the mighty Cheviot are outstanding. 5. Still more crags to come as you now leave Langlee Crags, in the direction of Housey Crags, via a thin sheep trace. Very quickly you will join a quad track where you will turn right downhill as far as a gravel track. Here you turn left. Continue with this track, through a five bar gate, until you reach a directional fingerpost. At this point turn left to climb up to and behind Housey Crags (GR NT957218). 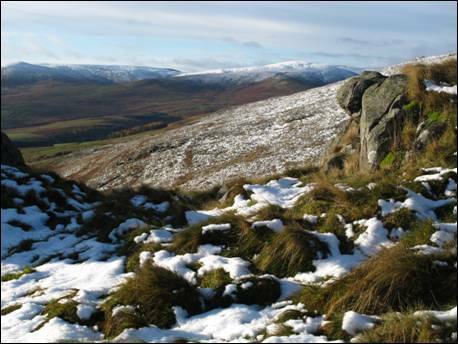 Listed by Tony Hopkins in his book, `The Cheviot Hills A Sense of Wilderness` as one of his six favourite crags, these are probably the most visited in Northumberland. They appear at their most dramatic when viewed from the Harthope Valley. Behind, and on slightly higher ground, lie Long Crags. As you climb, aided by further directional fingerposts, to and across the north-west edge of the crags you will be passing close to the remains of a Roman Age farmstead, standing on a natural terrace below an outcrop of rock. Continue to follow the path across the top of the crags and at the southern end go over the stile. You are now on Kelpie Strand, a stretch of moorland leading to the steep slopes of Hedgehope Hill. Follow the path, aided by further fingerposts, across potentially damp ground and then begin the climb of this, the second highest of the Cheviot Hills. Take your time as you go and be sure to admire the view back down to the Harthope Valley and beyond to the wild Northumberland coast. 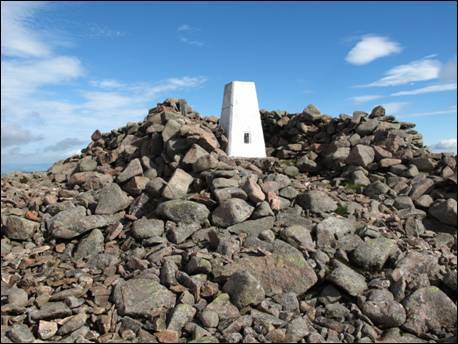 The summit is topped with a large cairn, incorporating a number of wind protecting shelters, wrapped around, at 714 metres, a triangulation pillar (GR NT944198). 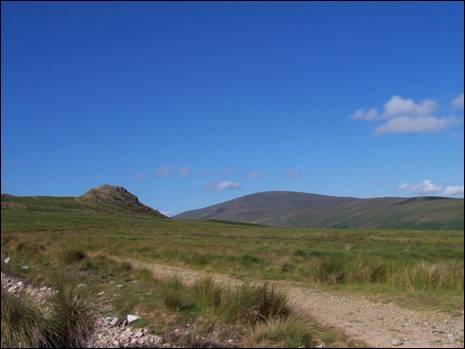 It is a fine hill, considered by many to be amongst the best in Northumberland. You can now judge for yourself. 6. Leave the summit via the small step stile and follow the fence down the south east side of the hill. At the 640 metre contour cross another step stile and continue in the same direction, keeping with the fence all of the way. Away, to your right, you will see the unmistakeable twins of Great Standrop, looking suspiciously like two enormous stone cairns. Eventually you will once again join the edge of Threestoneburn Wood, as you continue downwards over increasingly wet ground. In order to improve the habitat for the rare black grouse, 5 acres of Sitka spruce have been removed from the wood. It is intended to carry out more native planting, such as rowan and juniper, which produce small seeds favoured in the bird`s diet. Soon you will reach the watershed (GR NT958188) of the Dunmoor and Threestone Burns where you will need to climb over the facing fence and turn immediately left. Keep following the edge of the trees as you begin the final climb of the day, Dunmoor Hill. 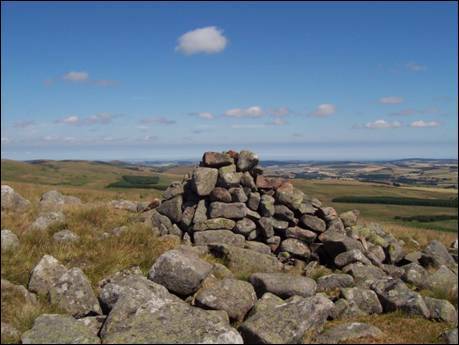 As the ground begins to flatten out you will need to make a short diversion to your right, first to visit the small rocky outcrop and then the tiny walker`s cairn, which marks the top of this 569 metre high hill (GR NT967182). 7. Return to the fence and follow this as it turns eastwards and then downhill through a single gate. There are excellent views straight ahead to the granite tors of Cunyan Crags as you continue to descend over easy ground. On reaching the crags (GR NT976182), if time and energy allow, have a scramble around before continuing with the fence through the rocks and downwards. When the fence meets with another one, you will recognise the stile (now to your left) from your outward journey, it is only a matter of turning right and retracing your steps back to the buildings of Greensidehill. Be sure to follow the main bridleway until eventually turning left to head back towards the farm. Once again on the tarmac road, turn left and a short relaxed stroll will bring you back to the dark and imposing scree of Brough Law. You will certainly feel that you have been for a walk in the hills.